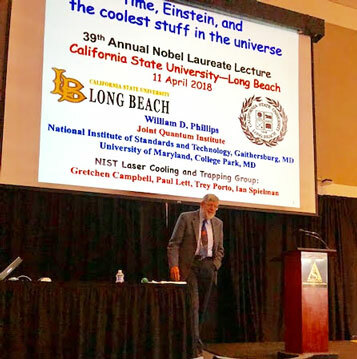 provide some comments on a public lecture at CSULB's 39th Annual Nobel Laureate Lecture series. William Phillips kept the audience engaged as he talked about some of the coolest stuff in the universe. 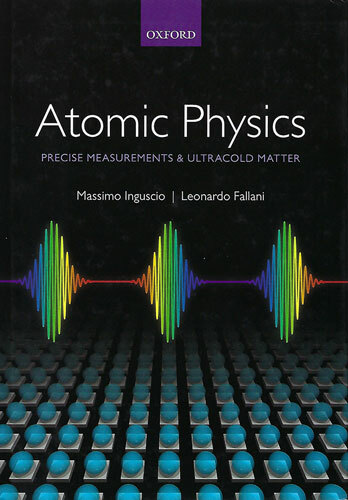 This reference is to the laser cooling technique now used to produce very cold collections of dilute atoms. When it comes to temperature we think of hot things like the sun's surface at 5700 K or cold things like the temperature of outer space which is quite cold at only about 2.7 K. But the coldest places by far are in laboratories exploring laser cooling which can easily achieve temperatures as low as one micro K, that is one millionth of a degree above absolute zero, and working towards cooling down to just one billionth of a degree. Pretty cold! He described how laser cooling, which sounds like a contradiction in terms, works and I don't have any of his slides so I will go to one of my textbooks for help in explaining how laser cooling works. 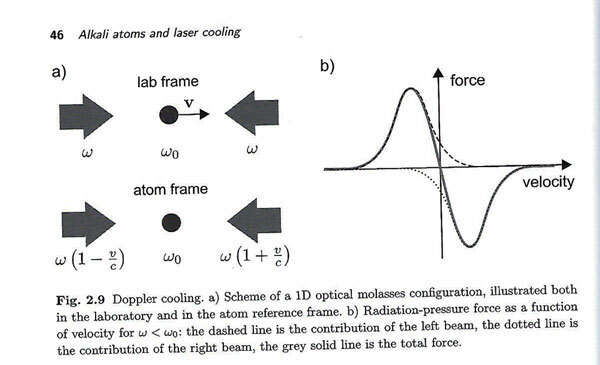 The basic idea of laser cooling is shown in the following diagram. For simplicity, the diagram shows what happens in just one dimension, but real laser cooling applications occur with the same technique in all three dimensions. Laser light, like all light can be considered to be made up of photons, which even though they are massless, do carry momentum and when they collide and are absorbed by an atom their momentum can slow down another particle. At room temperature, a typical atom in these experiments is moving at say 300 meters per second. So by tuning the laser frequency to be just slightly below the normal absorption frequency for the atom, then the atom's velocity can be decreased and controlled to a very low velocity, say just millimeters per second, which corresponds to a very low temperature. At these very low temperatures, atoms can be observed to display quantum effects normally just associated with elementary particles. Recall that elementary particle physics tells us that everything around us is made up of either bosons or of fermions. These units each come with a property called spin and bosons have integer spin while fermions have half integer spin. The best example of a boson is the ordinary light photon, or another example for the particle physicists out there is the Higgs boson. The fermions include all the other normal particles like protons, neutrons, electrons and neutrinos. Bosons and fermions as groups each have their own statistics and behavior which is described by current quantum mechanics. Well it turns out, and this was the key point that I got from Phillips lecture, is that atoms themselves can be considered to display fermionic behavior or bosonic behavior if the sum of their constituent parts totals up to integer spin or some number ending with 1/2 spin. So once, these atoms are cooled down to very low temperature, we can start to see them behave as either bosons or fermions. 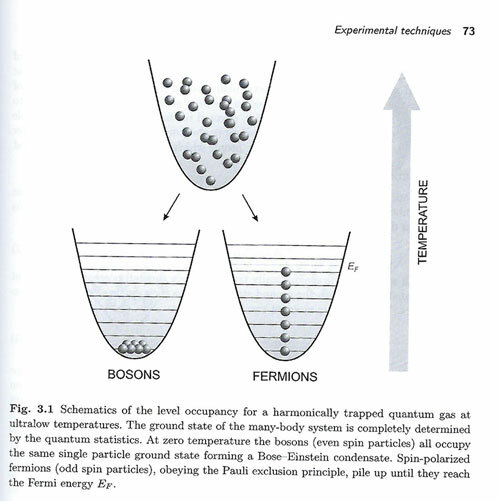 Check out the diagram below which shows cooled bosonic atoms occupying the same energy state, while the fermionic atoms all line up in different energy states because no two fermions can occupy the same energy state, which is known as the Pauli exclusion principle. This capability to get groups of atoms to behave in this way leads to the capability to make more precise measurements of quantum properties and maybe even new physics or new applications. Ok, finally let's get into some of the action and images for the teeny cloud chamber. 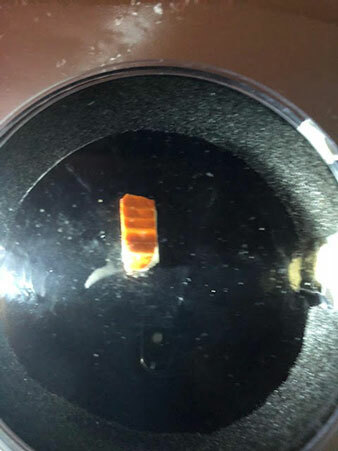 Remember that my interest in cloud chambers was rekindled by my previous first time experience of being one of many judges at the OC Science Fair, where one of the young scientists had constructed and operated a small cloud chamber. I was quite excited by that and decided that I too would get a small cloud chamber and have some fun too! You can find the other details of that story by reviewing the blog post of March 21, 2018 (Just go the main website page and search the calendar for the particular date). 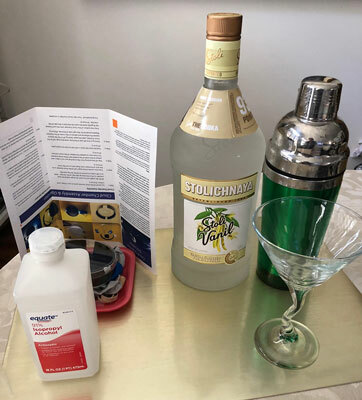 So, I got out the cloud chamber kit and read the instructions and found I needed a source of alcohol that if it was a mixture with water, had to be at least 90% alcohol. Where to find this? Well, most drug stores have solutions of rubbing (isopropyl) alcohol which are 91%. So, I bought a small bottle for the experiment and arranged it next to another sample of alcohol for use by the experimenter. So, no matter the outcome of the experiment, I can toast to the attempt no matter the actual outcome. Now, the only other ingredient needed was a block of dry ice. I found a source of dry ice about 8 miles away so it was easy to pick up some dry ice, which if you are curious was going for about $1.80 per pound. The cloud chamber kit consisted of two plastic dishes, which just barely slide together to form a closed chamber. The instructions call for saturating the side of chamber, which are lined with felt, with the alcohol solution. Then put the sample radioactive material inside and close up the chamber. Then inflate the included rubber balloon and rub it in your hair to charge it up and then put the balloon in contact with the chamber for about one minute. Now you are ready to darken the room lights shine the little included flashlight through the side of the chamber and wait for the streaks to show up. 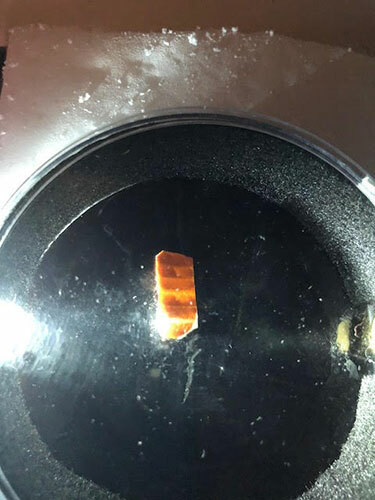 So, we know that this little cloud chamber is subject to the static charge put on it by the balloon and there are some stray magnetic fields about, both of which we know can affect the trajectory of charged particles. It is too early to try to include the effects of these forces in our little experiment here, so let's just see what we observe. 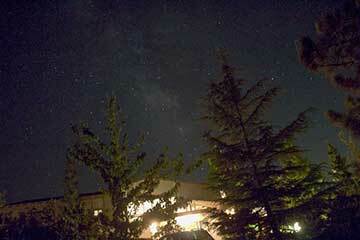 Ok, so for this first attempt, I saw streaks in the chamber about 1-2 time per minute. Then with one hand holding the flashlight and the other hand holding my cell phone, I took a couple of photos of the streaks. 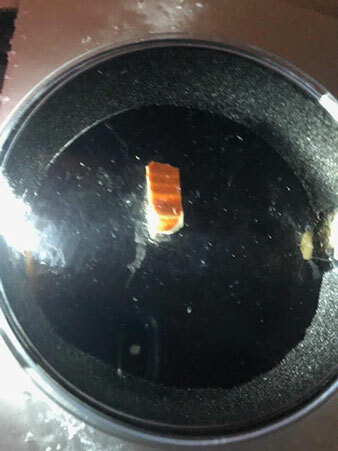 The next time I repeat this experiment it will go much more smoothly if I don't have to hold both the flashlight and try to operate the cell phone camera at the same time. This last photo sample seems to have captured a streak that is sort of curly cue shaped. The photo is not quite as clear as it was when the track first appeared. The cellphone shutter speed seems to have smeared it out in the dim light of the room. Probably taking a short video of the cloud chamber would best capture the appearance and eventual disappearance of the tracks would be the best way to document and show what happens. It almost looks like the track is made by a particle spiraling under the influence of a magnetic field. But where would that come from? It doesn't seem likely that my steel table top is magnetized. So, there you have some of the first images collected with this teeny weeny cloud chamber. I haven't tried to count the number of tracks per minute or identify what kind of particle caused the track or anything slightly more scientific. That effort will have to come later because now I want to go back and celebrate with some of the 37.5% alcohol! I did notice though, as you can see in the photo below, that even after 6 hours, the dry ice block had not yet completely evaporated. 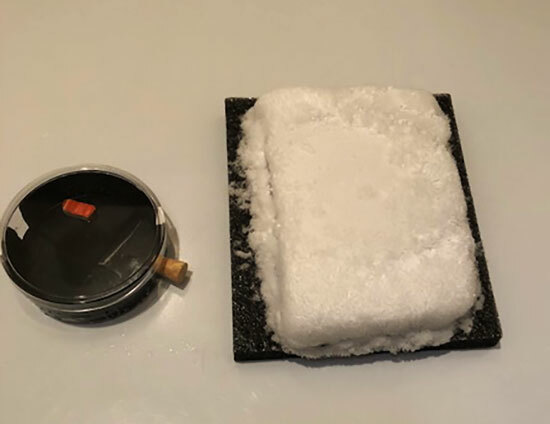 Once I brushed off the condensate, which really looked and felt like snow, the underlying dry ice block was smaller but ready to go on. Ok, that is about it for this week. I was thinking about going to the OCA Star Party but am sort of tired out by all of this experimenting and celebrating! I also have been trying to work my way through all the mail and accumulated magazines and journals that showed up while we were gone on vacation in Portugal and Spain and found many interesting topics of which I will report on one astronomical topic on 21cm radiation next week.